I've never had a pushrod failure, why change them? Most people think if they haven’t had a visible problem (broken, bent or galling) with their pushrods, they may feel that nothing better is needed. This is wrong! Even on mild performance applications, a pushrod that is flexing can cause problems from power loss to component failures elsewhere in the valvetrain and there may be no actual pushrod failures. How do I figure out what diameter to use? Usually cylinder head design limits the diameter you can use. Without having sophisticated testing equipment, the general rule is to use the most rigid pushrod that will fit. The 3/8″ diameter is more rigid than the 5/16″ diameter, so if it will clear the cylinder head, use the larger diameter. To determine pushrod diameter, see the information on our page, Pushrod Diameter. Do higher ratio rockers affect the pushrods? Higher ratio rockers will increase the load on the pushrod because the rocker is moving the valve side faster. This means more pushrod flex as the valve starts to open. To get the most performance from higher ratio rockers a rigid pushrod is a must. Why is precise pushrod length important? It is very important to determine proper pushrod length. Improper pushrod length can cause a number of problems including excessive valve guide wear, lessened valve lift, valve stem side thrust, and also rockerarm retainer interference (in some cases lash caps can be used to help correct rockerarm to retainer clearance problem). A compromise of as little as .025″ of pushrod length, will over time, negatively effect the service life of all valve train components. How do I insure proper pushrod tip selection? 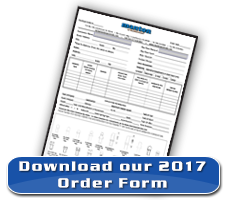 Check the radius of the lifter receiver cup and measure the rocker arm cup/ball with a radius gauge before ordering to help prevent mistakes. Verify the material of your rocker arm adjusting screw. Also watch for variations from stock radius in aftermarket lifters. Improper ordering may result in a part failure. Why does my pushrod have an oil hole through it? Make sure significant oil volume reaches the rockerarm end of the pushrod. This will prevent galling due to excessive heat generation and lack of lubrication. To prevent interrupted oil flow to the pushrod, it is very common and sometimes necessary to modify the lifter body so oil flows through it no matter where its position in the lifter bore (call for details). Oil restriction in the engine block is not normally recommended. Many engines that incorporate a rocker shaft do not oil through the pushrod (Hemi). The oil system feeds from the other side or through the rocker shaft thus no oil hole is required in the pushrod. Why do I need a higher series pushrod? Many problems occur when a pushrod is inadequate for the application. This is why we have different series of pushrods. Such as our Series #5 with a superior heat treating process to strengthen the tube for rigidity to assure maximum stability. When possible, try to use larger diameter pushrods to spread out the load and lower the stress on the tube. This will help lessen pushrod deflection. Heavy wall tubing can also minimize compression of the column. When do I need a heavier wall tube? In high cylinder load applications larger diameter heavy wall tubes are a must. These applications include the use of a blower, turbo charger, nitrous oxide, nitro methane, high spring pressures, and engine speeds over 7,000 rpm. How much pushrod to head clearance do I need in my engine? Do not allow over clearance for the pushrod. This may cause the pushrod to move around or deflect more then needed. Clearance of .010 to .015 on aluminum heads at the closest point of contact is sufficient. We also need .015 to .025 clearance at the lifter bushing or tie bar of lifter. The surface of the cylinder head or engine block can often be utilized like a large guide plate and dampening device which stabilizes the pushrod. Make sure there are no pushrod binding or interference problems when turning the engine over during assembly. Can I put tapered pushrods in my guide plate style engine? Tapered pushrods can not be used in guide plate applications. Improper clearance and interference problems are sure to occur. Use only straight tube pushrods, specifically surface hardened for guide plate use in this application. Note: See Series #2 and #4 for guide plate applications. When should I use tool steel tips? If you are using a tool steel rockerarm adjusting screw, it is almost always suggested that a tool steel pushrod tip be used at the rockerarm end. This will ensure proper compatibility. What type of lubricant should I be using with Manton pushrods? In race applications and engines with flat tappet camshafts, it is imperative to use engine oil containing sufficient friction modifiers. The most commonly known friction modifiers are zinc, phosporus, sulfur and soluble moly disulfide. Read the bottle or contact your oil supplier. Do I have to change my adjusting screw when I get new pushrods? When installing new pushrods in an engine or after replacing pushrod tips, it is a good idea to carefully check the rockerarm adjusting screws to make sure the contact surface of the screw has not been damaged. A damaged adjusting screw surface will damage the new pushrod tip. Are tuning changes needed when I get Manton pushrods? 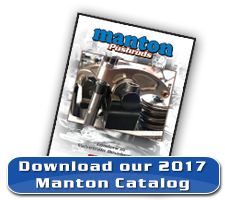 When using Manton pushrods, adjustments to valve cam timing, valve to piston clearance and fuel curve may be required. This is due to increased rigidity in the pushrod column, making valve action more accurate and efficient.